It seems that 2016 will be the year of the disc golf tour. In addition to the annual PDGA National Tour Series and the recently revealed Disc Golf World Tour, a third event was announced tonight: the Disc Golf Pro Tour, a set of six tournaments running from June through September next year. It’s something that Dodge has been pondering for decades, he said. But that doesn’t mean that there wasn’t some trepidation involved. With the events running in a geographically and chronologically-organized fashion – a wrinkle not found in the other tours – the DGPT aims to make touring more sustainable for professional disc golfers. With 2016 viewed as a smaller test run for a larger tour in years to come – Dodge and Heinold envision 12 or more $50,000-payout events in future iterations – the hope is that connections can develop between players and spectators, similar to other sports. Three-time United States Disc Golf Champion Will Schusterick said an organized tour would change the toll that travel takes on him as a player. Three-time World Champion Valarie Jenkins agreed that the series’ itinerary would benefit professional disc golfers. The venues chosen to host the events also have spectators and quality of play in mind, with five of the six tournaments being played on Top-20 ranked courses (per DGCourseReview.com). With these three different tours on tap for 2016, Heinold said he realizes some people will see them as competitors. Dodge pointed to the DGPT’s Tour Championship as a feature that distinguishes it from the PDGA National Tour Series. 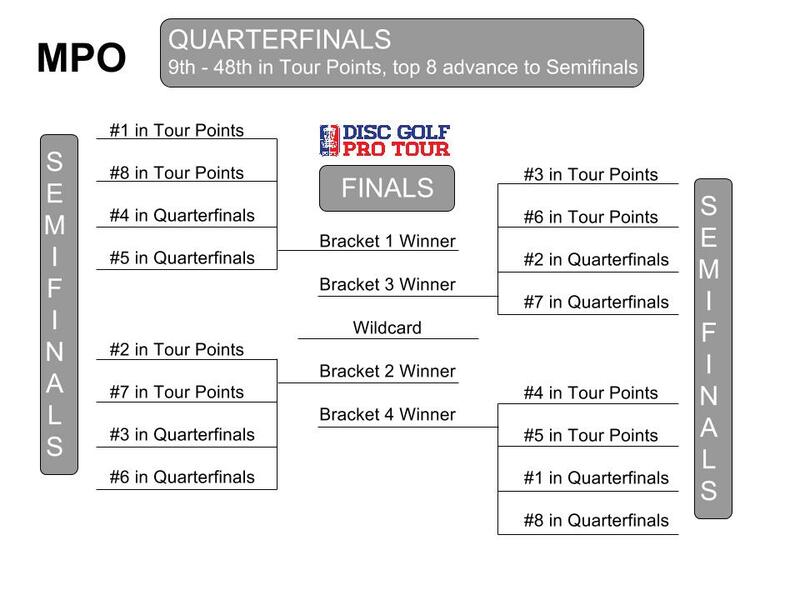 The DGPT has created a system in which players will earn tour points based on their finishes at the five DGPT events, with the top 48 earning a spot in the quarterfinals of the Tour Championship event and the top eight getting a bye into the semifinals. It’s a stark contrast from the current NT points series that can reasonably be clinched prior to the season’s final event. Then there are the payout and viewership aspirations, too. The DGPT will aim for this achievement by teaming with Smashboxx TV for live coverage. 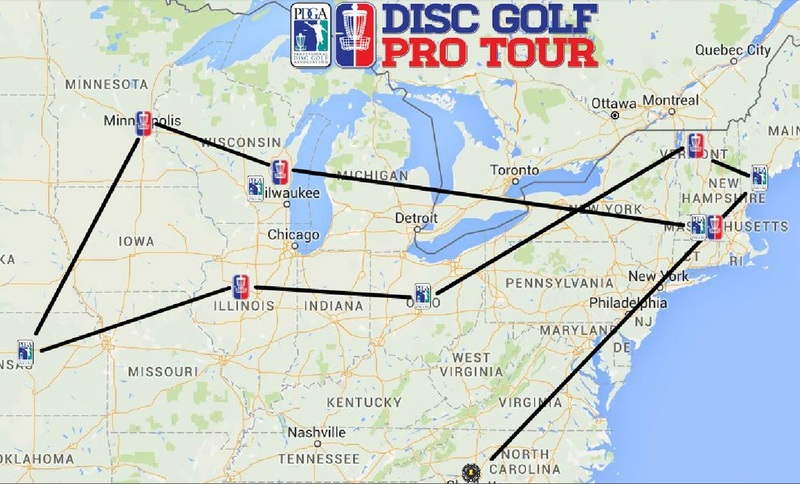 With this focus on live coverage a staple of both the Disc Golf World Tour and the DGPT, organizers of the latter noted that there are other clear contrasts that set the events apart. The aforementioned schedule is a key difference – the World Tour hops across the pond to Europe with a spread of events that will see American players likely going back and forth to compete – as is the inclusion of a women’s division as part of the Pro Tour. Finally, there is the festival aspect that DGPT organizers hope will attract spectators from outside the tournament boundaries. With radar gun booths, putting courses, face painting, inflatable obstacle courses and other special event staples, the DGPT stops are aiming for a broad range of appeal. Aside from attracting spectators and sponsors, Heinold also said the festival can help attract a future player base. Emphasizing the “cool factor” will help, Dodge said. It dates back to his days of first tossing a Frisbee while playing Ultimate, and is something he wants to retain as the sport continues to grow. Or, in the case of the Disc Golf Pro Tour, where the sport is going. This is an amazing idea. Can’t wait for the 2016 season. However I live in Michigan and noticed there are no stops here. I wonder how or if we could get a stop here in Michigan. We have an amazing disc golf scene as well as discraft them selves here in the state along with a plethora of great courses. Yet we have no tour stops. How can we/I help to change this. We hold the largest b tier tournament in the world annually with our state championships and I would love to see an a tier or nt played here besides the occasional worlds. Thanks for reading Josh! There is a 2017 tab on the Disc Golf Pro Tour website that might be helpful. I know they are keeping it small to test the concept this season and hoping to expand in the future, so you can get Michigan ready. Cheers!